LAN security standard IEEE 802.1ae (MACSec) uses AES cipher in the GCM mode, while the disk/tape encryption standard IEEE P1619 uses the XTS mode. Since GCM and XTS share some of their basic components, a combo GCM/XTS/CBC core is not much larger than a dedicated core for either of the modes. The GXC3 core is tuned for mid-performance P1619 and 802.1ae applications at the data rates up to 10 Gbps. The core contains the base AES core AES1 and is available for immediate licensing. NewIV Input (XTS mode only) Marks the last block of the data unit if followed immediately by the first block of the next data unit with different IV. The GXC3 implementation fully supports the AES algorithm for 128 and 256 bit keys in Galois Counter Mode (AES-GCM) as required by the 802.1ae IEEE standard, in AES-XTS mode as required by the IEEE P1619 (SISWG) standard, a the CBC-AES mode per NIST specification SP800-38A. The core is designed for flow-through operation, with input and output interfaces of flexible width. GCM additional authentication data precede the plaintext in the flow of data. 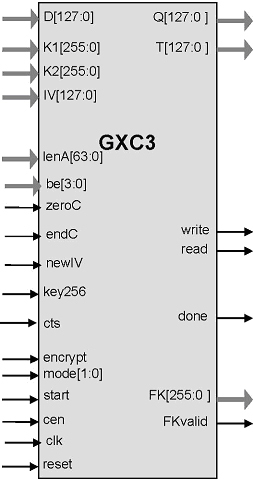 GXC3 supports both encryption and decryption modes. The core can be a subject of the US export control. See the IP Cores, Inc. licensing basics page, for links to US government sites and more details.